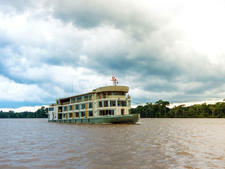 Delfin II is a small cruise ship that travels on the tributaries leading out of the Amazon Basin in Peru, and it is designed so that travelers are embraced by views of the rain forest. It's owned by Delfin Amazon Cruises, which was founded by Peruvians Aldo Macchiavello and his wife and partner, Lissy Urteaga, back in 2006. Aldo runs the company, while Lissy, an interior designer, is responsible for the soothing, elegant decor inside the ship. She also plans the daily itineraries, and, along with the chef, makes long-range meal plans. The 30-passenger luxury vessel's top deck was installed in 2014, and offers an air-conditioned lecture room with large picture windows on three sides, a massage room, an exercise room and a large open-air observation lounge with a bar and cushioned chairs for relaxing. The open-air spaces serve to bring the feeling of the rain forest -- the smell of rain, the symphony of the night creatures and the ever-changing scenery -- to the ship. 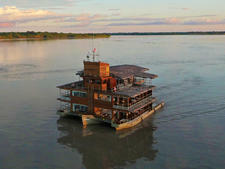 While the oceangoing ships traveling across the Brazilian Amazon offer myriad amenities, the emphasis here is on exploring the rich ecosystem of the 8,000-square-mile Pacaya Samiria National Reserve. A trip on one of Delfin II's four- or five-day cruises is a respite from the world, a time to contemplate the scenery and the rich array of birds, mammals, amphibians and reptiles found here. The ship has no TV, telephones, Internet, traditional nightclub entertainment nor 24-hour food and drink service. It's not the kind of cruise where you snuggle up in a lounge chair and settle into a novel. Passengers move from activity to activity with great gusto. You're on the alert and moving fast from 5:30 a.m. when the pre-breakfast expeditions begin. From early morning to evening the schedule varies, so there's no chance to get bored. There's no rule that a passenger has to participate in every off-boat excursion, but on our trip, few of them skipped any. Passengers tend to be intrepid and curious explorers, well-traveled internationally, who are always on the lookout for the next soft adventure. Except for family groups, the age range is 50 to 80, and passengers come mainly from the United States, Australia, Canada, Europe, South America and Russia. Almost all speak English. Think tropical casualwear rather than American business casual. If there is any dress code, it's that men usually do not wear T-shirts to dinner, but instead put on an informal collared shirt. In the evening, women wear cotton or jersey blouses and slacks with sandals, though sneakers are fine, too. During the day, most people wear hiking or athletic clothing. Comfortable walking shoes are essential for the off-shore excursions. Check Delfin's guidelines for recommended clothing. Jungle wear -- long-sleeve shirts and pants -- along with adequate repellant is useful for keeping away mosquitos. The onboard currency is the U.S. dollar. The suggested gratuity is $15 to $20 per person, per day. Tip in cash, either in U.S. dollars or Peruvian Nuevo Sol. Passengers are provided with an envelope at the end of the trip to fill and deposit in a box on the boat. Tips are divided among the crew. No additional tipping is required at the bar.